Your mom was right when she said to eat your broccoli. Broccoli is one of the most powerful protective vegetables against cancer and heart disease. It contains glucosinolates that activate the genes responsible for cleansing the body of toxins. Broccoli also contains many nutrients including folate, vitamin B6, vitamin K and fiber. But don’t fret if your family doesn’t like broccoli, try broccoli slaw or its relative broccolini – which has a sweeter taste. Veggie slaws are a great way to get kids and adults to boost their vegetable intake. 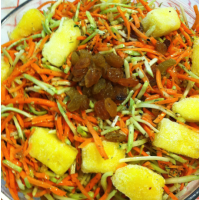 You can substitute jicama, sliced broccoli stems and shredded carrots for many of the coleslaw recipes out there. Rinse and drain broccoli slaw – a great task for your children. In a big bowl mix mayo, Greek yogurt, apple cider vinegar, sugar and celery seeds together until blended. Kids love to help measure and mix! Put broccoli slaw in bowl. Using large utensils, toss until mayonnaise mixture is evenly distributed. Eat and enjoy! Tell your child that this yummy dish helps turn on their body’s super shield to protect it from viruses, bacteria, cancer and heart disease! « What Kids Eat Today Prevents Cancer Tomorrow!